Helicopters within the mountains operate only by Visual Flight Rules (VFR) which means that they are only allowed to fly during daylight hours - 30 minutes before sunrise > 30 minutes after sundown. As the winter season progresses the number of flyable hours increase as we slowly move from winter to summertime. 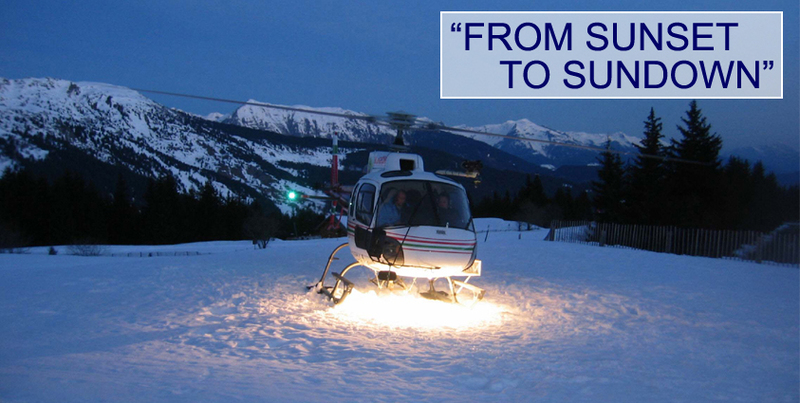 Please note after the helicopter has flown its mission either dropping you off in your chosen ski resort or at the airport the helicopter must then have enough time to fly back to its base before it gets too dark. The transportation of passengers in the dark or at night is forbidden in the mountains. *Approx. Flying Hours - December: 0730-1730hrs - April: 0700-2030hrs. If you have chosen a plane with a late arrival time please be aware that if your flight is delayed the helicopter might have to depart the airport without you in order to get back to its base before it gets dark! If this is the case the helicopter will still have to be paid for. When choosing a flight try to choose one that arrives within good time in case any unforeseen circumstances occur. If you have chosen a flight with an early departure time from the airport it may not allow us enough time in the morning to perform a weather check to ensure that the weather is good enough for your helicopter to fly. If the weather is bad and the helicopter cannot fly, early morning departures do not allow enough time to get you to the airport by taxi. In these instances we will need to perform a weather check the night before where we will inform you of the circumstances from which you the client will have to make the decision! Please note that nobody can 100% predict the weather so it is possible that the wrong decision could be made. We will try to provide you with as much information as possible that will come straight from the pilots who know what they are doing but ultimately the choice will be down to you whether to chance it or not! To prevent this situation from happening try to choose a flight that allows enough time to perform a weather check to be made in the morning. This will then allow you enough time to get to the airport if the weather is bad. The first weather check can be made at Approx. 0800hrs (slightly earlier come March) - Please discuss with a member of the Whitetracks team if you are unsure. Helicopter companies allow for flight delays in their planning but if your plane is delayed by a long time on a busy day when the helicopters are booked to perform many transfers for example February half term. It might be the case where your helicopter will have to depart without you in order for it to go and collect the next clients. If your helicopter has to depart without you, you will still need to pay for the helicopter! Please think about insurance to cover this in case this happens plus whether it is possible for you to be reimbursed by the airline company through which you were delayed by.